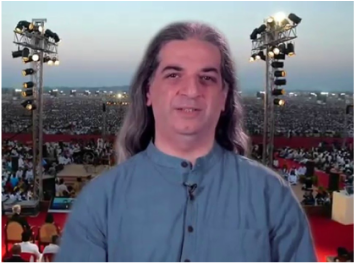 With a post-graduate in Mathematics from the Indian Institute of Technology, Bombay, Khurshed Batliwala, or "Bawa" as he is fondly called, says that he decided to teach meditation over mathematics. "It was better to teach people meditation and make them happy rather teach mathematics and make them miserable,” he quips.One of the designers of the youth workshop, YES!+ (Youth Empowerment and Skills), he inspires young people the world over, empowering them to lead the lives they want to lead rather than getting stuck with the lives they have to lead! Bawa plays multiple roles and as you move from sentence to sentence you will sail through them. You will come across beautiful stories that reflect him as a pianist, a great cook, a mathematician, a meditator, a teacher and a devotee. Khurshed Batliwala conducts interesting workshops such as the Mathemagic, the financial literacy workshop, an introductory workshop on western classical music appreciation. He has recently even put together a workshop to teach people how to cook and enjoy the experience! ​Khurshed holds an M.Sc. in Mathematics from IIT Bombay. He is a Parsi and is fondly called Bawa, a nickname he inherited from his IIT days. More than 20 years ago, he decided he would rather teach people how to meditate and make them happy instead of teaching them math and making them miserable. He became an Art of Living teacher and this allowed him to do exactly that and gave him the freedom to explore many of his varied passions. He loves music and plays the piano, is a foodie and runs the Cafe at the Art of Living Bangalore Ashram, enjoys long walks, is a certified Cranio Sacral Therapist, has designed his own board game called Mumbai Connection, is passionate about the environment, likes movies and theatre with happy endings... And absolutely enjoys teaching. With Dinesh, he has co-authored his first book - Ready Study Go! - Smart Ways to Learn, being published by Harper Collins India, scheduled to be in bookstores by December 2016. He has created workshops to teach mind mapping, mathematics (not the type that makes you miserable), cooking yummy vegetarian food, and how to appreciate western classical music. His latest workshop is 'Use Your Brain' and is based off a few chapters from his book. It creates a paradigm shift in the way you learn. It makes the process of studying efficient, enjoyable and meaningful. It will change the way you think and possibly even bring about a transformation in the way you live. He is a highly acclaimed and prolific speaker having represented Art of Living in many National and International fora. He has given numerous TEDx talks all over India. He brings to the table a smooth blend of cutting edge technology and science coupled with the ancient wisdom of India which he contemporizes and makes relevant for present day challenges. He is known for his warmth, wit and wisdom.